Vivitek is an up and coming brand who wants to make a name for itself in the cut throat world of consumer electronics, and have decided to roll out a new pico projector that is LED-based. This bright and lightweight device will also boast 3D ready capability, making sure it keeps up with the rest of the pack. Of course, in order to differentiate itself from the rest, Vivitek has decided to name this the Qumi (pronounced Q-me), something which is memorable and will definitely strike a chord when you talk about pico projectors. Consumers are pretty picky these days, with many of them citing brightness, battery life and picture quality being key factors where pico projectors are concerned, so head on to the extended post to see how Vivitek intends to meet these needs. First of all, the Qumi range of projectors will incorporate the latest LED and other leading-edge technologies and features, including stereoscopic 3D, to ensure that it is versatile enough to match the range of portable products out in the market. 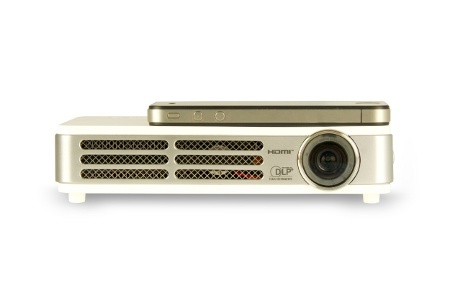 Tipping the scales at just 1.6 pounds, it is the first pocket projector in the world that is 3D-ready thanks to Texas Instruments’ DLP Link technology. There is also the presence of touch sensitive button controls and sleek design which are ready to see action with other compatible devices such as digital cameras, notebooks, smartphones and tablets. It will come in either black or white shades as it hits the market this May for $499 a pop. Well, hopefully the brightness level won’t be obsolete by the time it rolls out, and will it be the first if other manufacturers beat Vivitek to the punch where a release date is concerned?